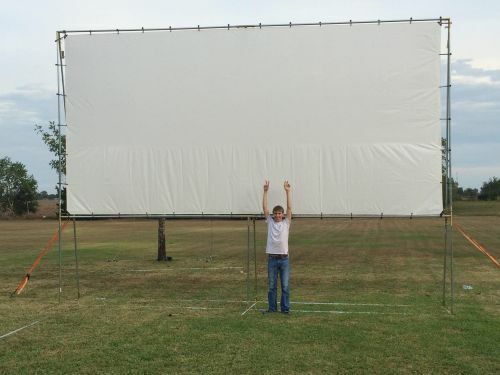 Please send us your photos. 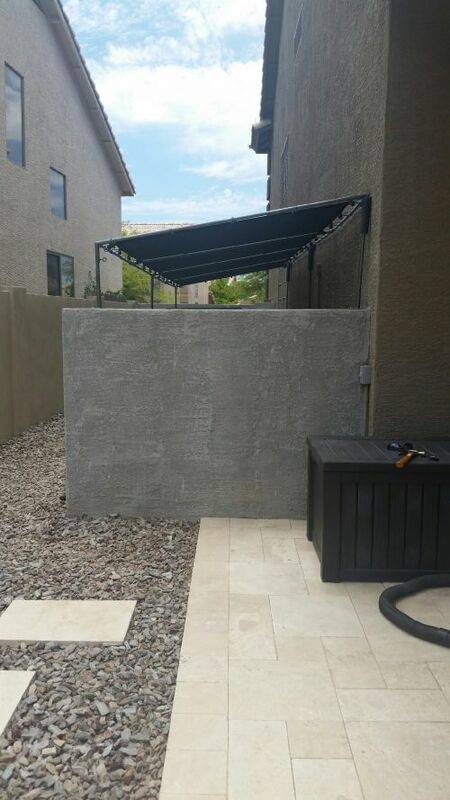 We would love to see your finished projects. Obedience JumpThank you! If you did not have the 4 way connector I needed to fix my jump, I would have had to buy a new one--a couple of hundred dollars expense! 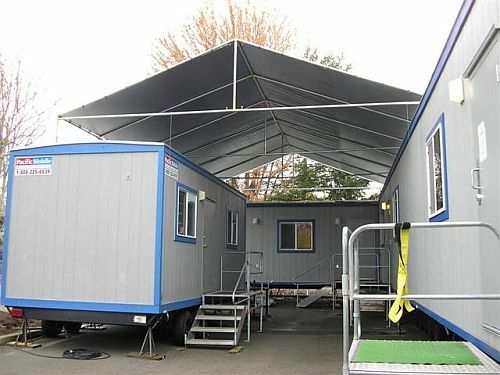 No legsHanger bolts and iron pipe clamps at 4 foot centers support frame between two buildings with 16x20 vinyl tarp. 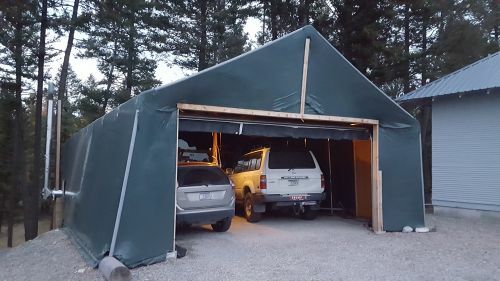 Garage in Montana. ShrinkwrapedWinter no problem. 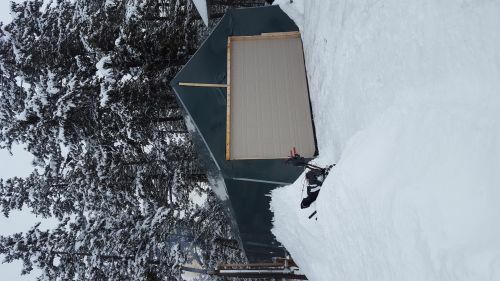 5 winters now with shrinkwrapped plastic walls and roof. 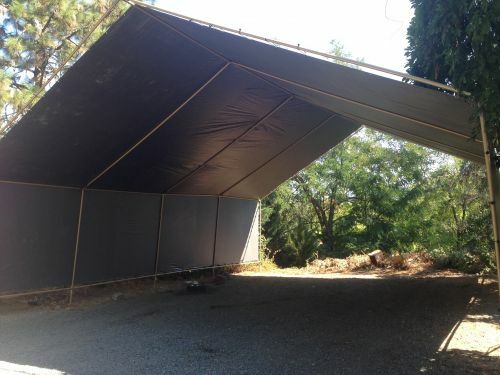 Multiple UsesWe purchased a 30' wide by 40' deep kit to cover our motorhome and RV, but first we used it as a tent for our wedding. 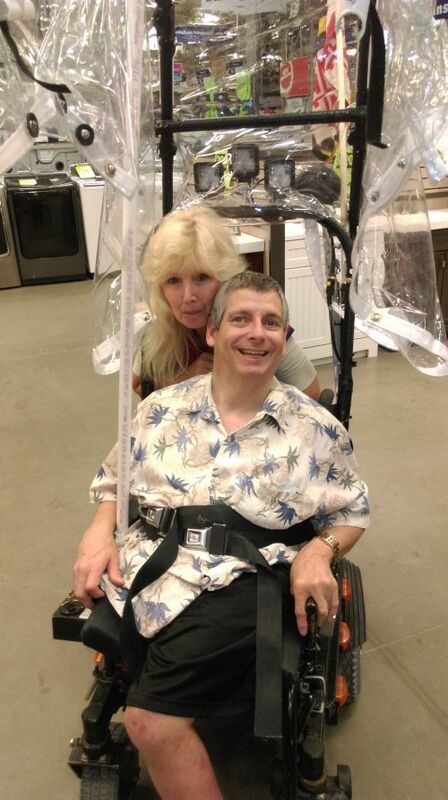 Here's pictures showing it accomplishing both tasks. 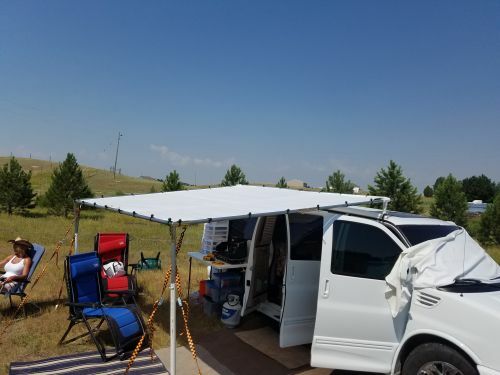 Van awning 10x10First day this was tested. A big storm with high winds, a tornado warning and hail. Worked perfect! Love our new canopy!We replaced a cheaply made canopy we bought from Home Depot with our new canopy from Creative Shelters. Love it! 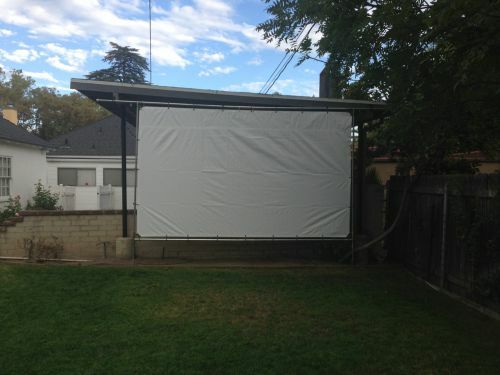 Movie ScreenPictures of our movie screen in the back yard. 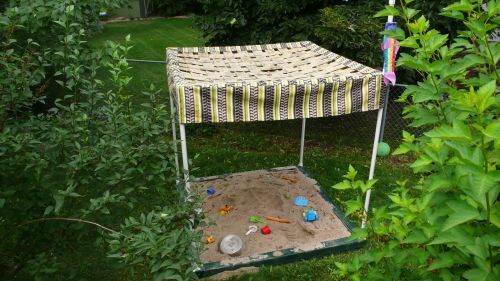 Sandbox CanopyCanopy over a sandbox. 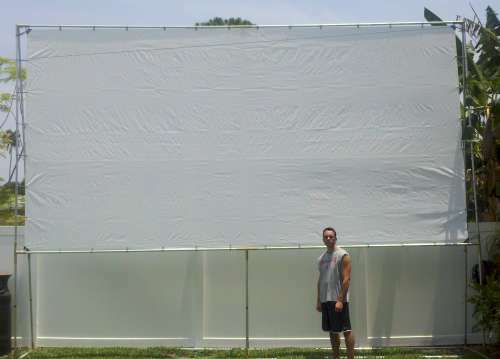 7x12 Movie ScreenInspired by the 10x20 Movie Screen kit, we used a 7x12 tarp and the fittings to make a flat structure that hangs from hooks on the pavilion. Custom fit lengths of EMT run to the ground the feet fittings. 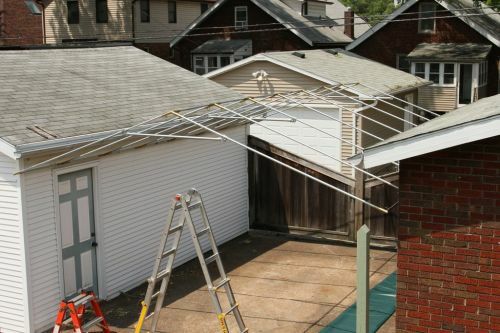 Custom lean-toI had to get creative so I could clear my roofs overhang and keep poles out of the middle of the deck. 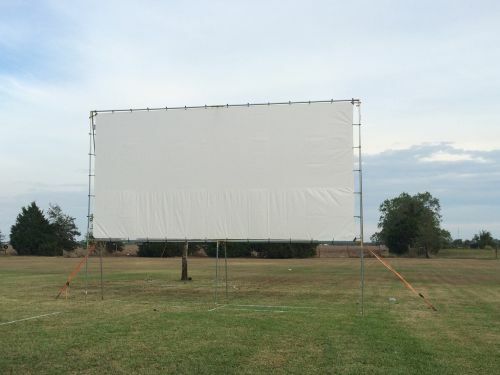 This setup is very sturdy and has held up, keeping us dry over the last month. Its really adds another room to the house. 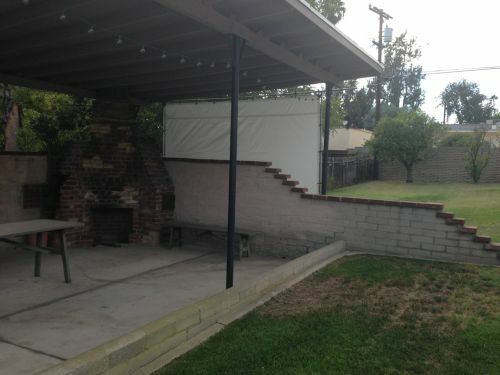 Performance stage coverOutdoor stage with wings/dressing rooms on each side. 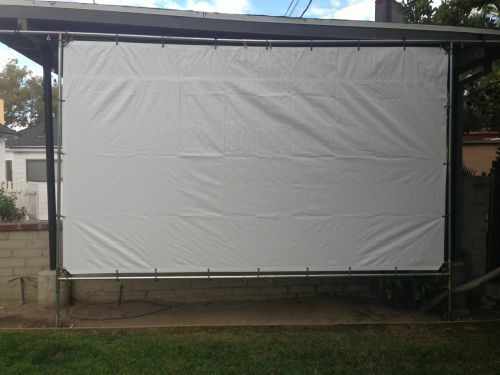 Outdoor Movie Screen Thanks to Ryan for sharing this photo of his 10ft x 20ft outdoor movie screen. 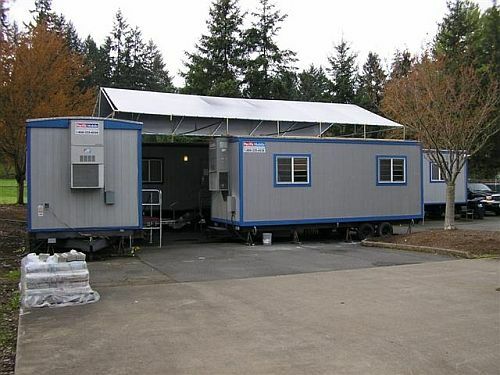 Custom Design Wood and Frame Canopies Thanks to Mac in the Eugene/Springfield, Oregon area for sharing these great photos of combined Creative Shelters frame fittings with custom brace bars and wood reinforcing. 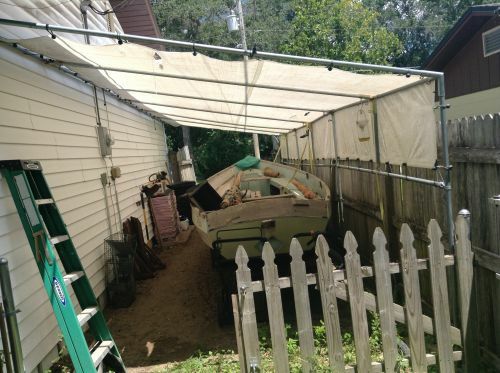 Sailboat Canopy and Deck Cover Thanks to Ted of Massachusetts who sent his photos of his canopy projects. 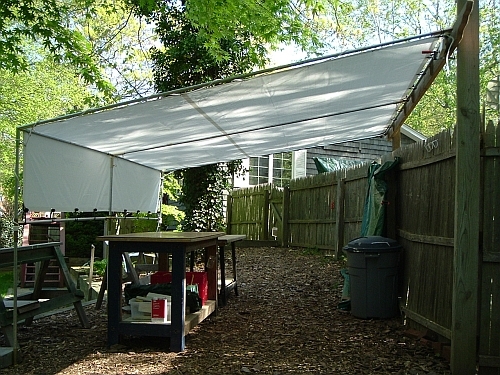 Ted started with a deck canopy using 1 5/8 inch high peak fittings and a white tarp. 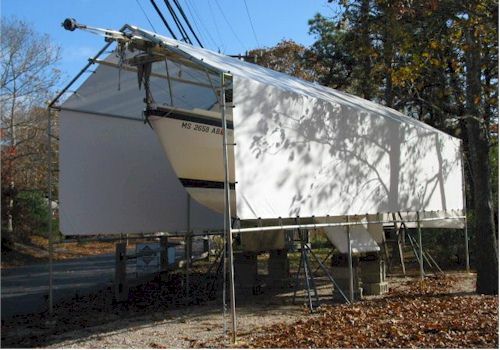 He then converted the Deck canopy into a canopy for his sailboat which is shown in the adjacent picture. 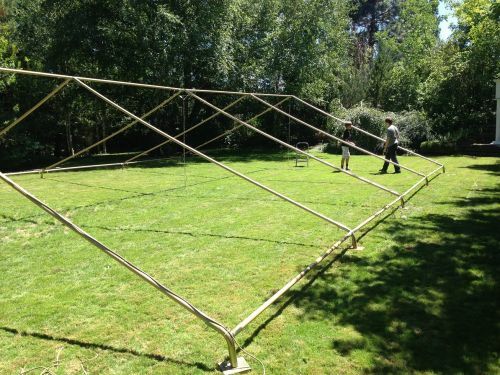 He is currently adapting the canopy by adding another section to cover an even larger sailboat which can be seen in the document link below the picture. 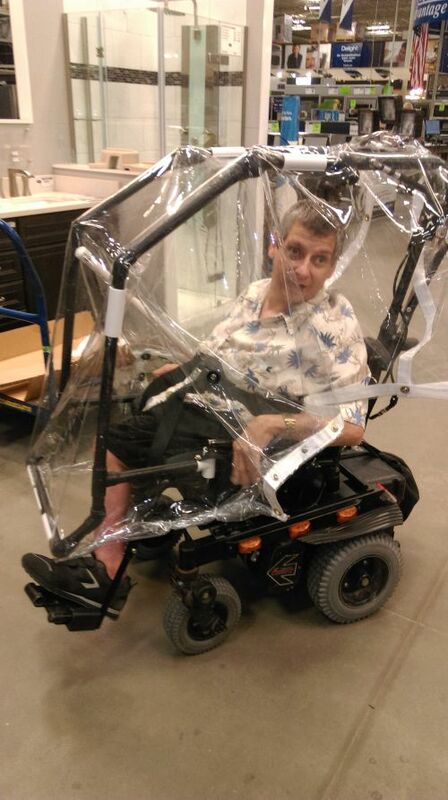 This is a very good example of the flexibility of our canopy parts. 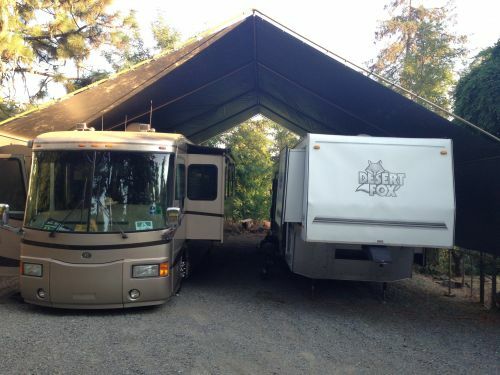 20 X 30 RV Canopy Thanks to our Mesa, AZ customer for sharing their great photos of this 20X30 foot RV canopy. 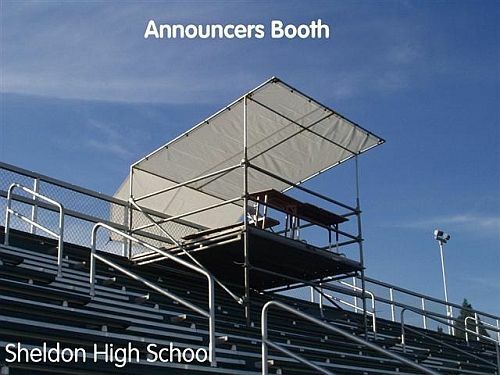 This canopy is constructed with 1-5/8 inch low peak fittings and covered with a silver heavy duty sun blocker tarp. 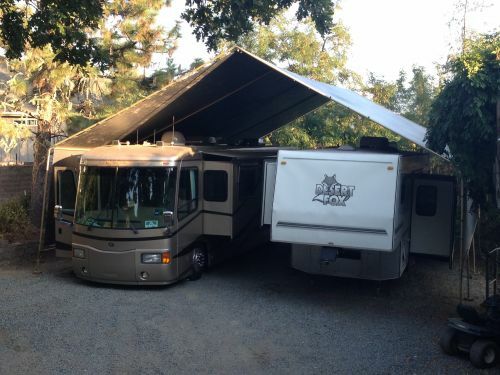 The canopy is wide enough to accomidate both an RV and additional vehicle. 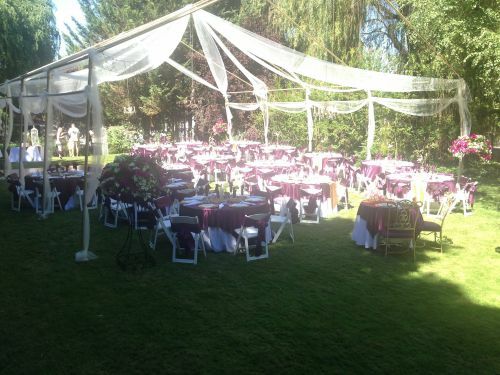 As can be seen in the picture they have also set up a table and chairs outside the RV for a shaded eating area. 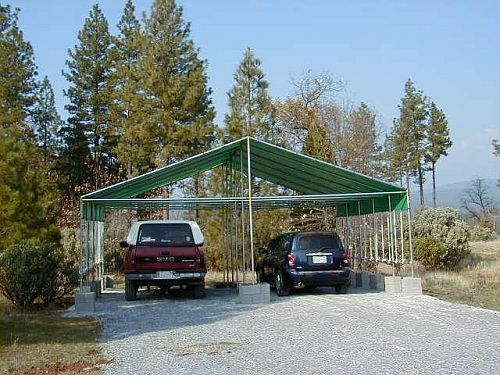 Carport for Two Cars This 20 ft X 24 ft carport was built to cover two cars. 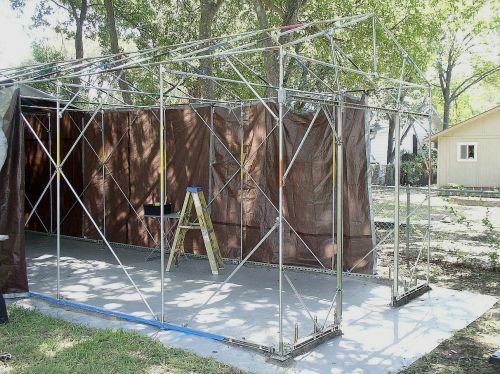 It was constructed with 1 7/8 inch chain link fence tubing and covered with a Green Heavy Duty Tarp. Please check out link below for more photos and tubing cut list information. 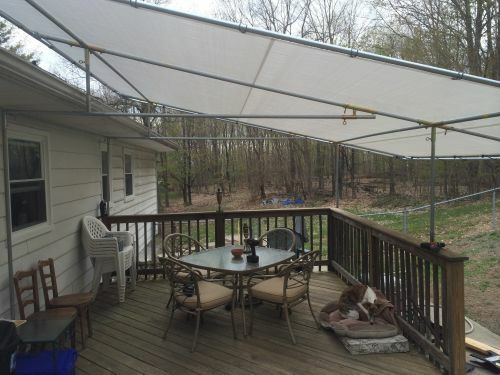 Patio Cover Thanks to Nancy of New York who sent these photos of their 20ft X 20ft Patio Cover constructed with chain link fence tubing and Creative Shelters fittings. 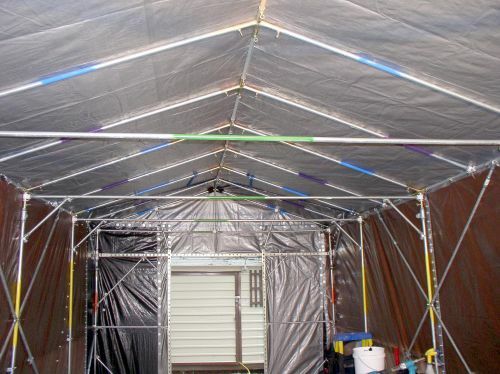 Camp Trailer Awning Thanks to Dale of Toledo, Ohio who sent these photos and setup documents for this Trailer Awning which significantly increases the outdoor living area in heat or rainy conditions. 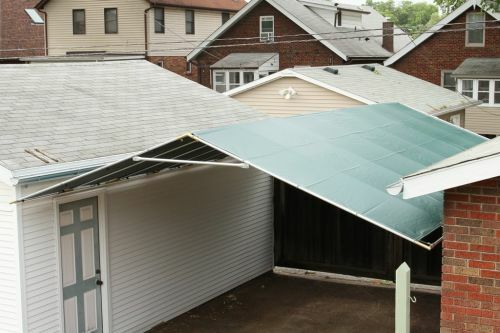 One person can put this awning up using the instructions provided by Dale. 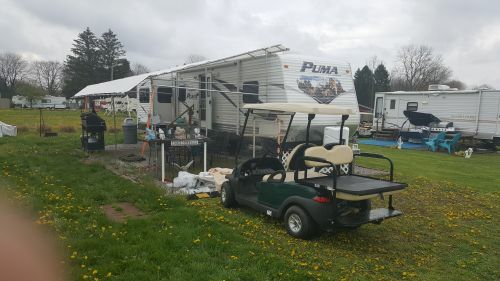 There are two sections 2 ft long at the top of the camp trailer that are permanently attached to the trailer. 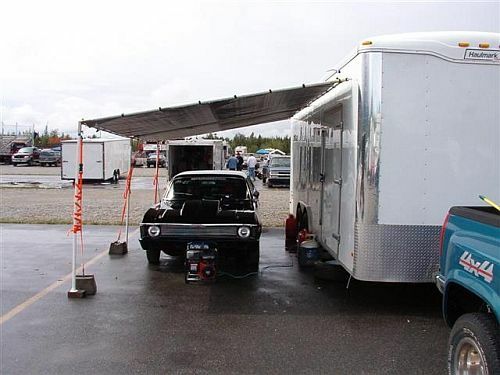 Custom brackets are attached to the original trailer awning and according to Dale were the hardest part of this project. Deck cover Thanks to Janel in Washington for sending us pictures of this deck cover project. 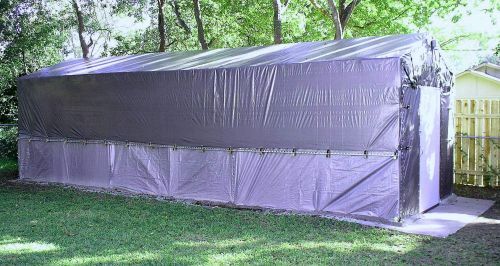 Tarp over two sides Boat Cover This photo of a boat shelter shows the use of our Tarp Over Two Sides design to increase the weather protection. 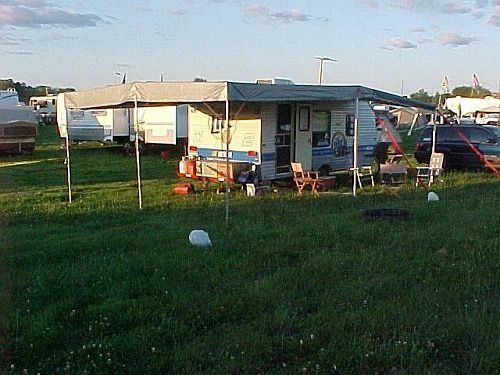 Legs can be cut to different lengths to accommodate uneven ground. 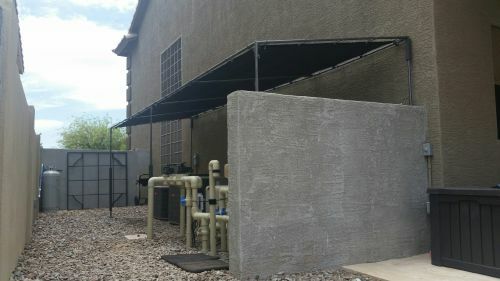 This unit was constructed with 1 3/8 inch chain link fence tubing with a Silver Heavy Duty Sunblocker Tarp. 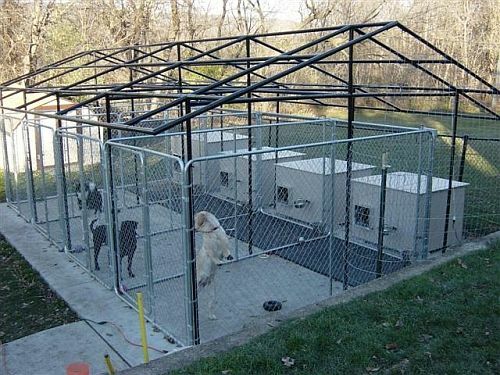 Multiple Dog Kennel Cover Thanks to Brad from Bloomington, MN for this great project photo of a multiple kennel cover. 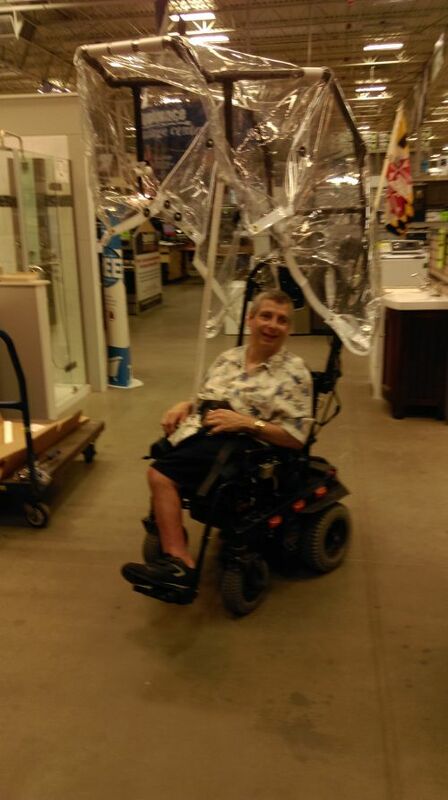 Brad has powder coated all the tubing and fittings before assembling this frame. 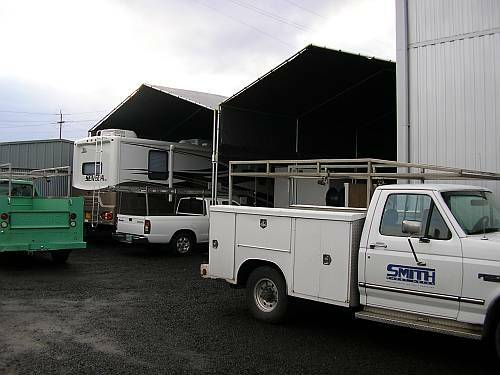 Party Canopy This picture of a party canopy was taken in our display yard in Springfield, Oregon. 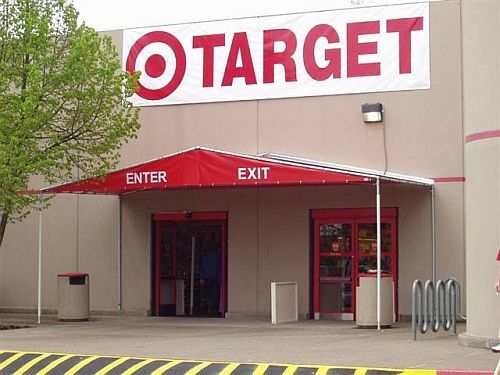 Temporary Construction Entrance This canopy was used as a temporary store entrance during construction. 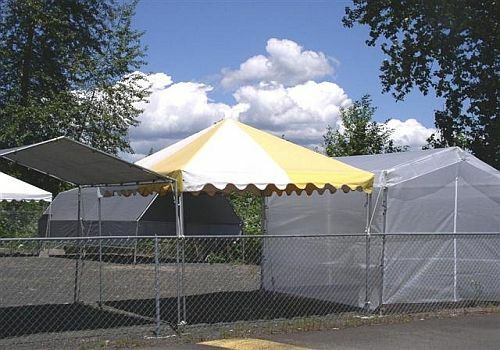 Temporary Firestation Canopy This 24 X 36 ft tarp canopy was constructed over these temporary fire station buildings using 1 5/8 in chain link tubing. 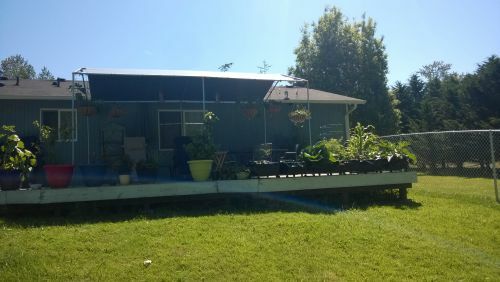 Tomato Growing Rack This picture was sent from Nancy in Junction City, OR. 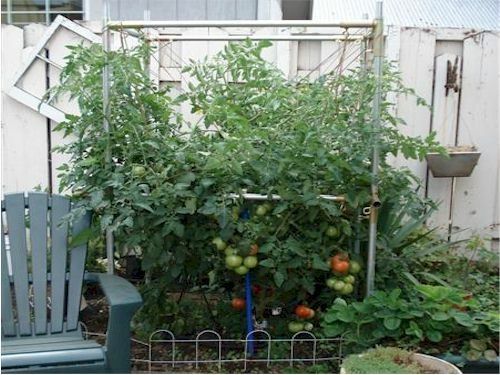 who says the fittings make great supports for large tomato plants. 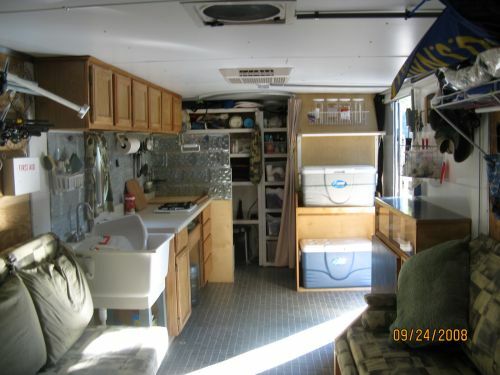 She used 1 inch EMT conduit and fittings. She also said she finally found a good use for pantyhose which she used to string the plants up with. 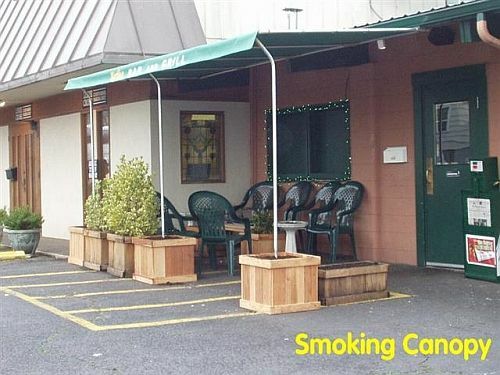 Outdoor Seating Area This canopy was constructed to provide an area for smokers outside this restaurant in an Oregon town that does not allow smoking indoors. 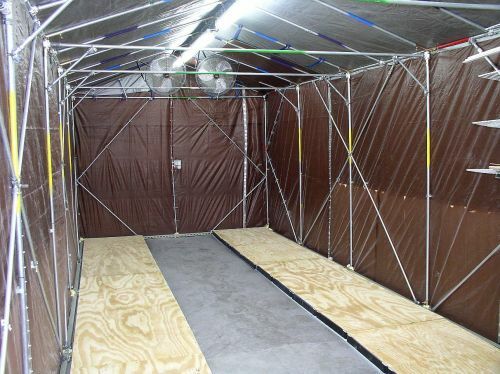 This same idea could be used for outdoor seating or provide additional covered waiting area for restaurants. 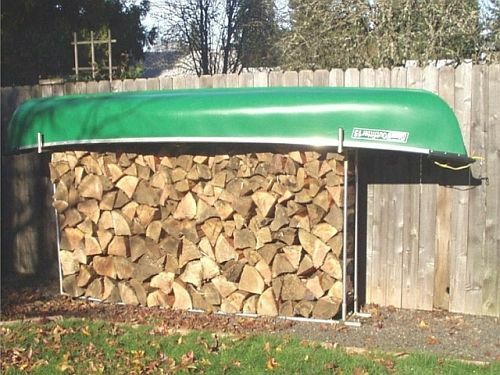 Fire Wood Rack Jim in Oregon sent this photo of a firewood rack he has created to store both firewood and his canoe. 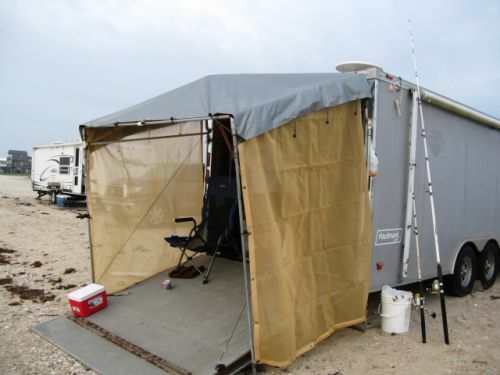 Boat Cover This great looking boat shelter was sent to us from Barrett in Louisiana. 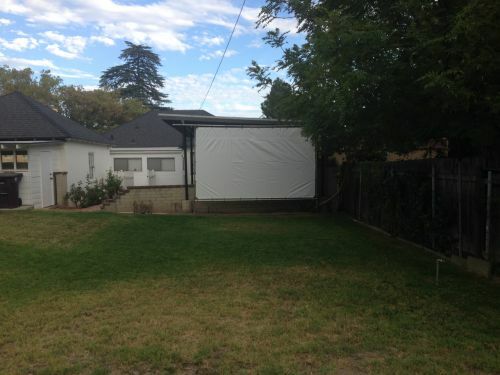 Directly from the front, you cannot see the tarp and it looks like part of the house. 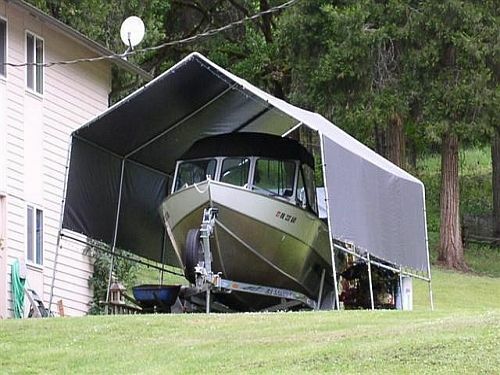 He added the roll-up shade in the front to give more protection and privacy for his boat. 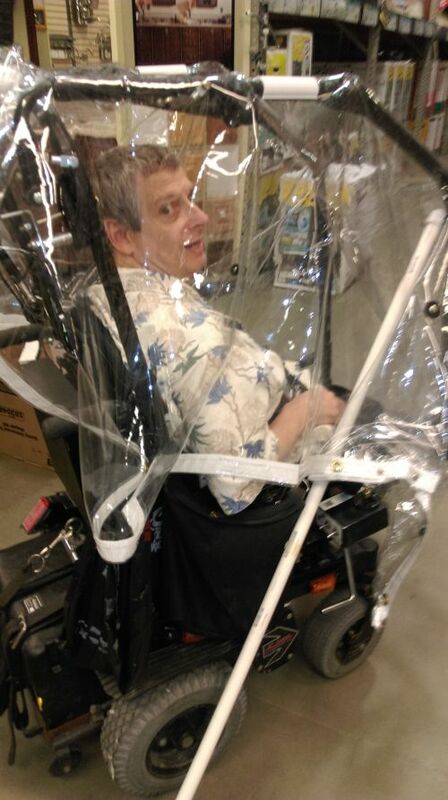 Quote from Barrett: "I bought one of your canopy kits and put it together myself. 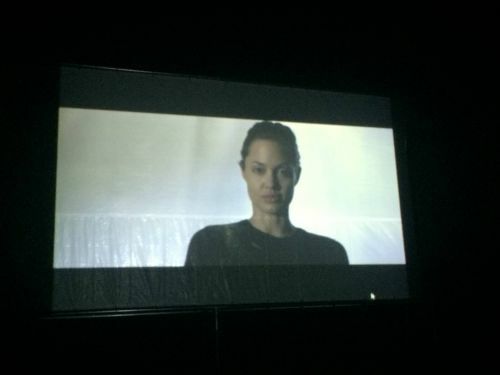 It was pretty easy and I think that it came out pretty good if I say so myself." 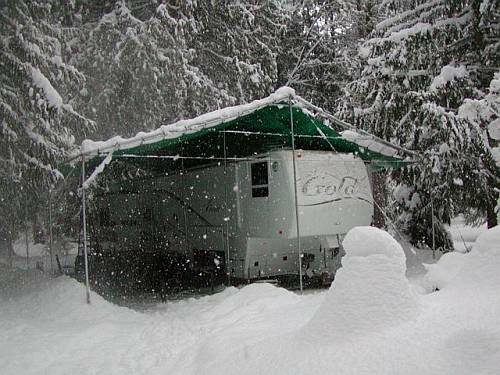 5th Wheel Canopy in the Snow Gordon sent these pictures of his 30ft by 40ft 5th wheel canopy which survied a major winter snow. 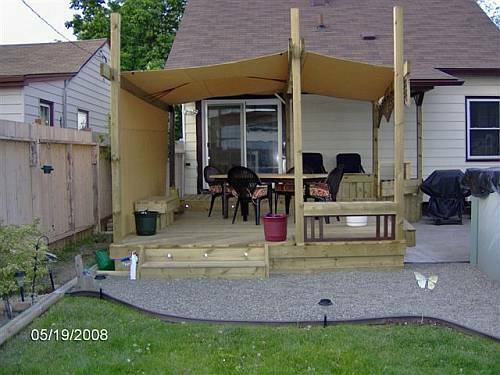 Canvas Deck Cover Donald from Windsor Ontario, Canada sent in these photos. 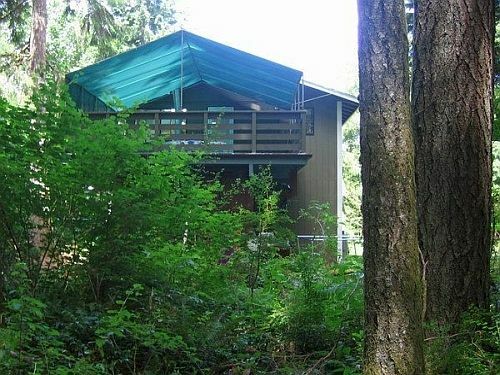 This is an example of a canvas tarp used to cover a great looking all wood deck structure. 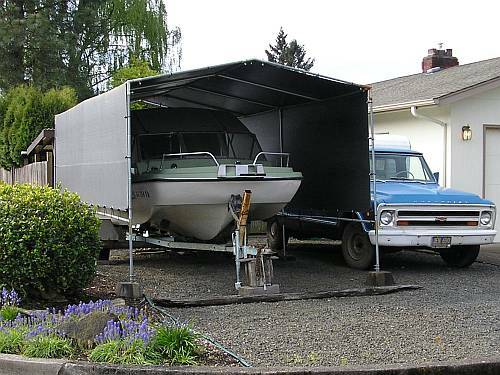 Lean-To Canopy for Boat Storage Gean of Eugene Oregon sent these pictures of his Lean-To which he built to keep the rain water away from the house and off of his boat and trailer. 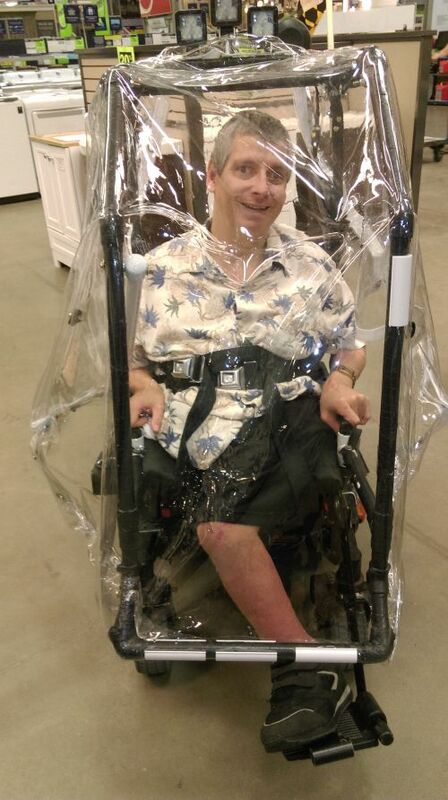 This canopy provides a place to work when it’s raining. 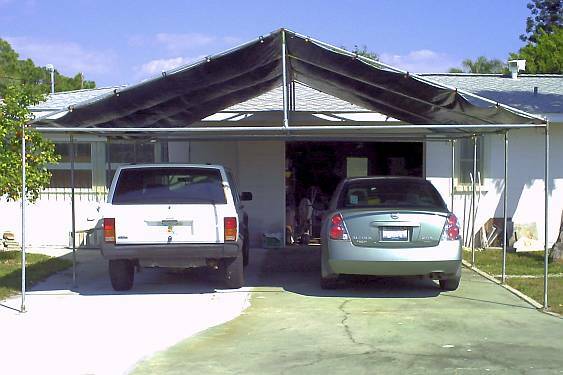 Two Car Carport At 101 years old John designed and built this two car canopy with reinforced trusses. 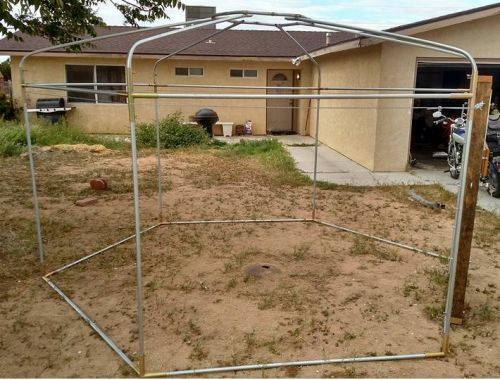 Take a look at the document to see more photos of his construction and design. 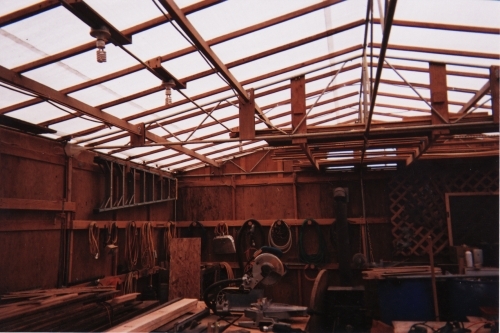 Shop work area and vehicle parking These canopies were constructed to provide extra work area and vehicle parking. 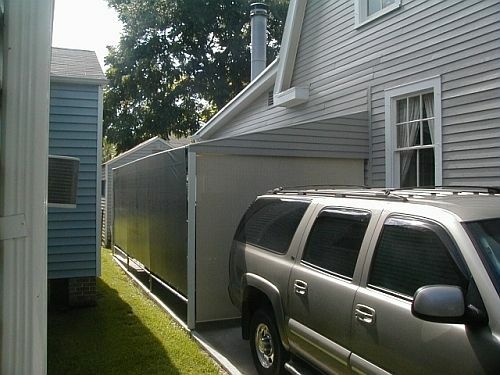 The height allows Large vehicles to be easily stored. 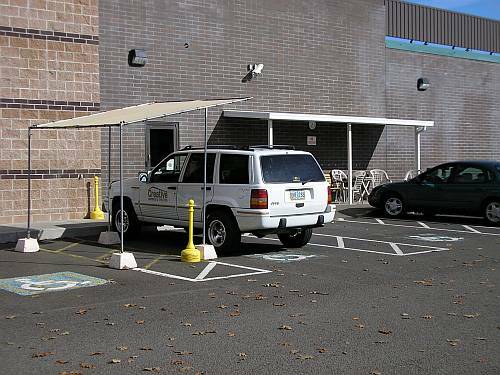 Slant Roof canopy used for handicap parking This Slant Roof canopy was installed to proved a dry area for handicap customers to load and unload. Auto storage canopy This large canopy was built to provide weather protection for work in progress. 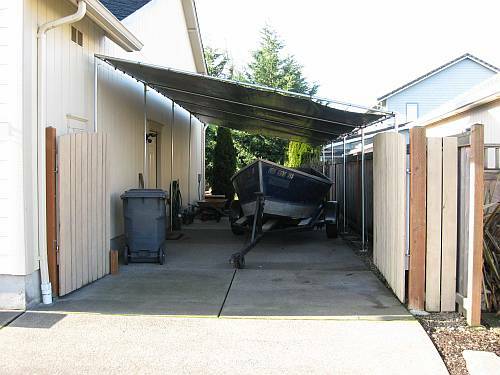 Boat Storage This tarp over side canopy was custom constructed to protect this owners boat. 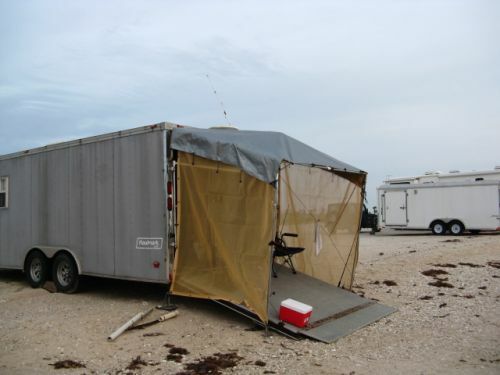 Tarp over side canopies are great for boat and vehicle storeage. 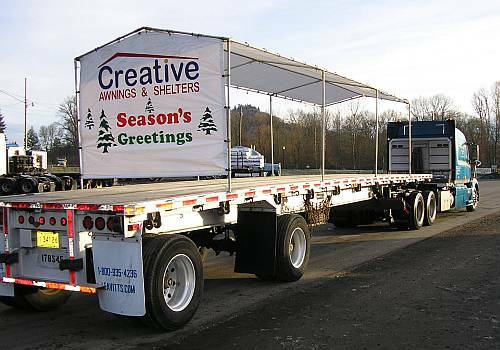 Float Cover This custom canopy was constructed to fit on this flat bed truck for use in a parade. 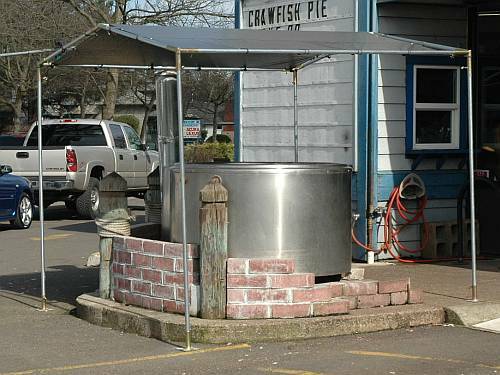 Crab Pot Shelter This canopy was built to provide some protection while cooking crabs in this large outside cooking pot. 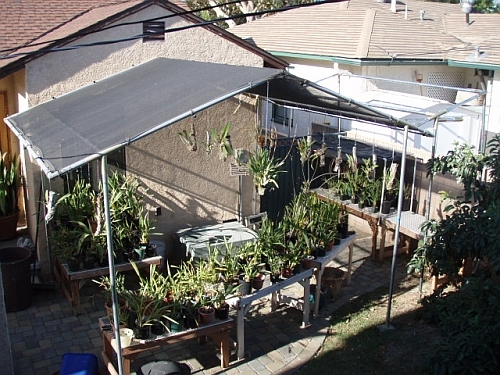 Shade House This shade house was constructed in Lakewood, CA to house and protect orchids. 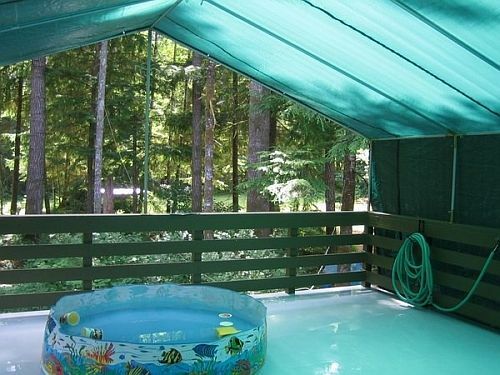 The cover is sun shade tarp to allow filtered light through. 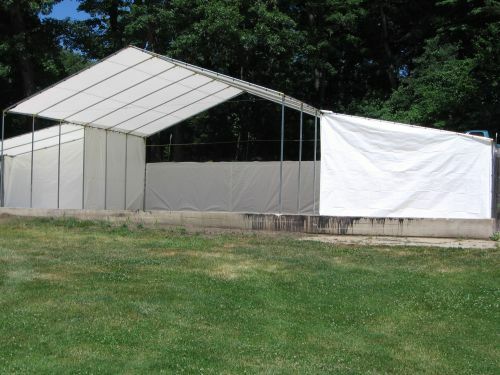 Lean-To Work Area Virginia from East Hampton, New York sent these photo of a Lean-To work area constructed using 3/4in fitting and a 12X12 white tarp. 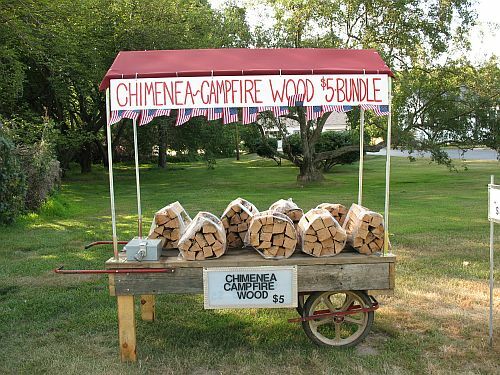 Wood Wagon Thanks to Kristin from New Jersey for sharing her design and picture of her Wood Wagon. The Frame for the canopy on this wagon was built with 3/4 inch High Peak corner fittings (HP3-A) and footpads (FP-A) covered with a custom roof material. 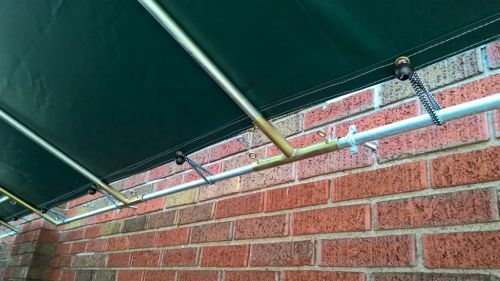 Kristin sent us the follow: I used your canopy fittings to construct this canopy to keep my wood bundles dry, and to help people see my stand from the road. 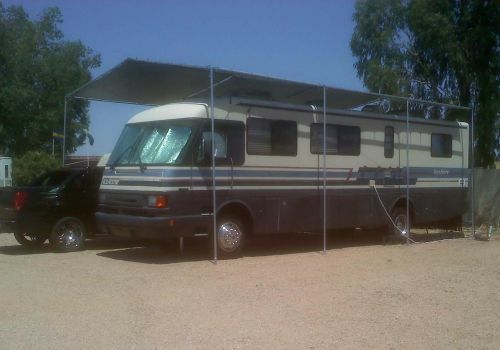 So far sales have been up since I put the wagon on the road. Thanks for a great product. I will be buying more fittings in the future. 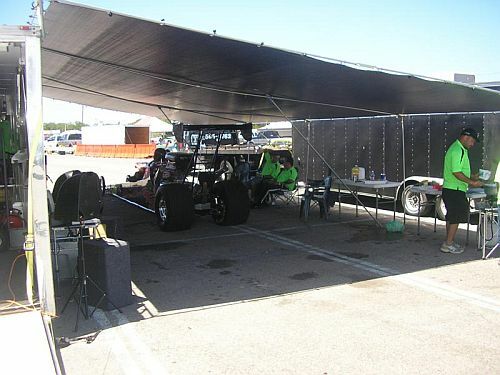 Race Car Shade Canopy Thanks to our Puerto Rico customer for sending us these pictures of his 20 by 40 race car project canopy. 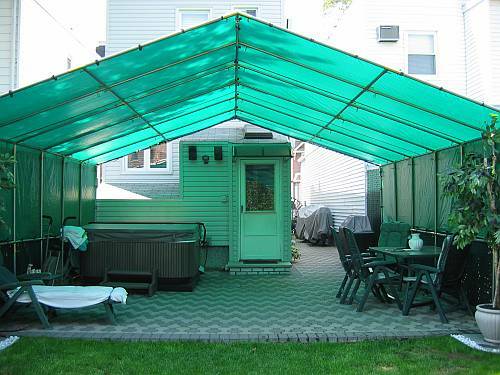 This canopy was built with ¾ inch fittings. 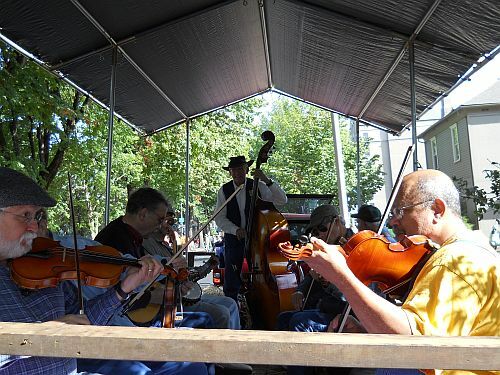 Oregon Fiddlers Association Trailer Canopy Thanks to our Oregon Fiddlers Association for these photos of their parade trailer canopy. 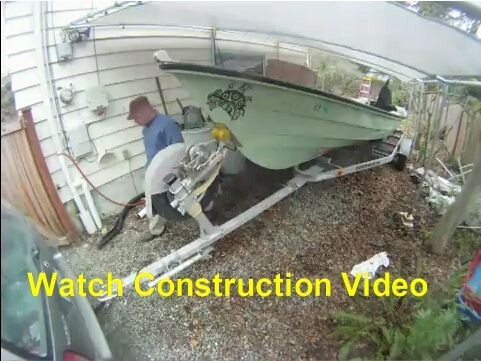 Boat Canopy Construction Video Thanks to Dave from Washington for this short video of his morning constructing this Slant Roof boat canopy. 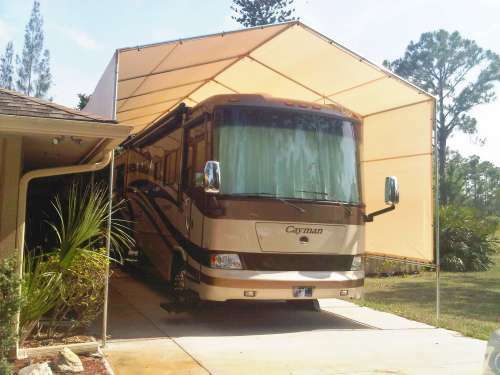 RV Canopy / Storage Shelter Thanks to Dennis in south Florida for sharing his 16ft 6in by 40ft RV canopy project photos. 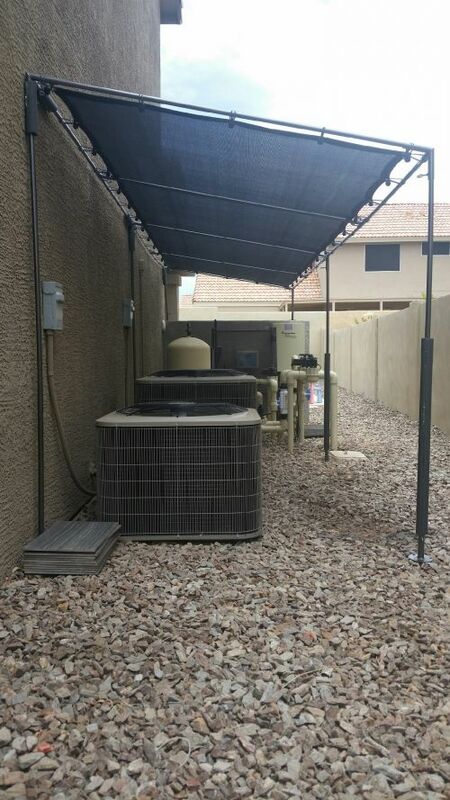 This canopy was constructed with 1 7/8 inch tubing, has 12ft high sides and is covered with a 30ft x 40ft desert colored tarp. Please check out link below for more information and photos. Thank you! 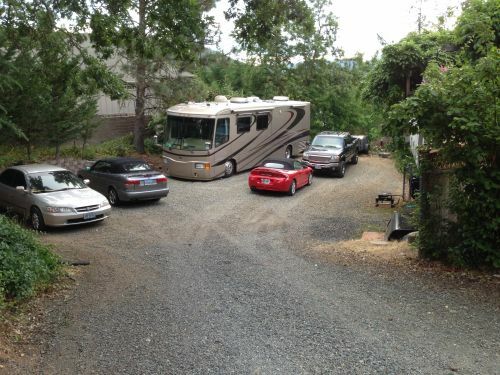 If you did not have the 4 way connector I needed to fix my jump, I would have had to buy a new one--a couple of hundred dollars expense!